Today’s Best Books for Boys list is for a special project I am involved in called Booking Across the USA. Each participant focuses on an author that was born in the state they live in and shares a bit of information about the author and the author’s books. They also provide an activity based on one of those books. We currently live Wisconsin. I was born and raised here but have lived in many different places. No matter where I am I always think of Wisconsin as home. Wisconsin is lakes, forests, fishing, it is Green Bay Packers football, cheeseheads and The Badgers, it is cheese curds, brats and booyah. They say Wisconsin has two seasons, winter and road construction. Wisconsinites have a great sense of humor, are hard workers and have big hearts. It is a wonderful place to raise a family. For this project I picked the author Lois Ehlert. I have enjoyed her books for many years. Lois grew up in Beaver Dam, Wisconsin and now lives in Milwaukee. Her books are a delight and her collage illustration style is what drew me in initially. We had so much fun choosing a book to do an activity from and we are excited to share it with you! Lois knew she wanted to be an artist from a very young age and luckily she had supportive parents who provided her with materials to work on her art, as well as a space of her own so she could leave her works in progress out on her table. In her book The Scraps Book she mentions being a big reader and deciding that one day she might like to make a book. The rest is history as they say. Lois has illustrated 35 picture books and received many awards in her career. Going through Lois’s books was very enjoyable. I picked the ones that the boys I shared the books with liked the most. She has a large list of books available and I would encourage anyone to seek out her other titles. Nuts to You! starts out with a cutout window where you can see a little squirrel peaking out. The squirrel is a bit of a scamp and the story is a fun one. Animals and plants within the story have labels telling what they are which is a nice touch and gives the opportunity for a bit of learning as well. Top Cat features a tough cat and a little kitten. Will they be able to get along? A good selection for households with siblings. Fun Fact: Lois Ehlert had a squirrel sneak in her window which inspired the story Nuts to You! This book has been a favorite for a long time. Leaf Man is a great book for so many reasons. If it were fall here I would have picked this as my activity book. Making pictures with leaves is something we do each year. Lois takes this to a new height and makes not only a leaf man, but chickens, birds, pumpkins, cows and more. The pages are cut away and shaped making for a nice change of pace. Zig-zags, dots, and shapes galore make up Oodles of Animals . When she says oodles, she means oodles! There are 64 animals in this book. Each animal has a little poem as well. For example: Crocodile. “Swimming and sunning, a crocodile’s happy. But when he meets humans, he tends to get snappy.” Perfect for those who love animals. Fun Fact: Lois Ehlert’s Color Zoo is a Caldecott Honor book. It is always time for pie at my house! Pie in the Sky is another book with added features. The cover features holes in it to allow the steam out of the pie. A few of the beginning pages are also cut. The story is all about a pie tree. Dad does the picking and baking which is a nice touch. We had a huge apple tree in our backyard when I was growing up and it provided many delicious pies so I do believe in pie trees! If you have someone who loves to draw and paint this is the perfect book for them. Hands : Growing up to Be an Artist is a bit about Lois’s childhood but also about her parents and their tendency to build and make things. Some pages are shaped. There is a lot of see here and the message is solid. They support her efforts in art and they are makers. Highly Recommended. Fun Fact: Lois Ehlert illustrated the popular Chicka Chicka Boom Boom . We reviewed another great books by Lois Ehrlert called The Scraps Book. It is a feast for the eyes and talks directly about her life and her art. Click through to learn more. Lastly we have Lots of Spots it was my son’s favorite so we decided to use it for our activity. Bright, bold colors and short poems sprinkle this delightful book. It would be seriously hard to pick a favorite animal here. This book is fun! We really enjoyed making creations based on Lois’s book Lots of Spots. Our activity is quite simple and very open-ended. We decided to make some of the wonderful collage animals in the book as examples. I know we are going to be doing this again as we both enjoyed ourselves and the time just flew by. 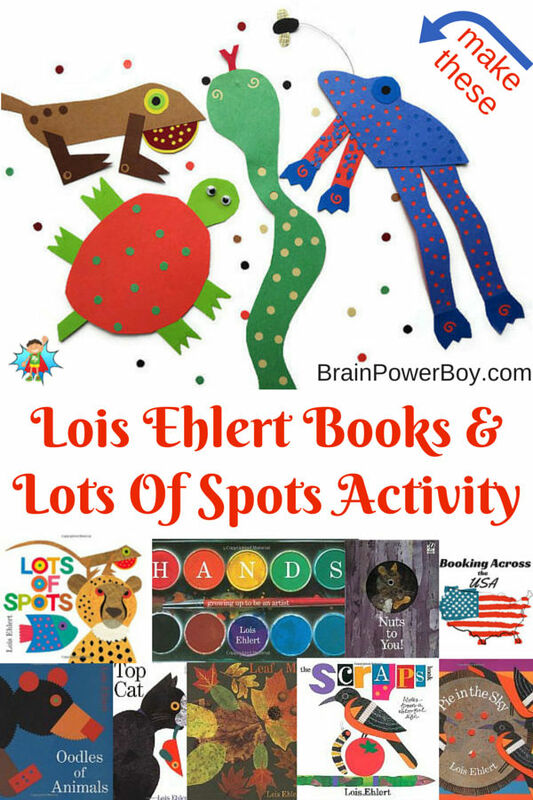 Grab a copy of the book Lots of Spots for inspiration and your supplies to get started. We chose to do reptiles and amphibians. Let your kids choose their favorite animal or start with something easy like a snake or a fish. I am simply going to have to make some birds because they are so incredible and I can’t wait to have a try making one of my own. There are 3 ways to get your spots. Punch out a bunch of different dots from construction paper and card stock then glue them onto your animals. See frog image for detailed view of this next method. For the body and the back legs the top layer is punched so the bottom layer can show through. For the legs I cut out two pieces of paper exactly the same shape and size. I then punched holes in the top (blue) layer and glued it to the bottom (orange) layer. For the frogs body I punched holes in the top (blue) layer and put pieces of orange and a different color blue underneath so they colors would show through. Once I got them positioned where I wanted them I glued them to the back of the blue top layer. For the frogs front legs, I punched a bunch of tiny spots and spread them out on the table. I then ran the glue stick over the orange legs and pressed them upside down on top of the dots. I had to fill in here and there with extra dots but I liked how it was a bit more random than punching. The snake was made with holes punched in the top (green) layer and another (yellow) layer underneath. The turtle’s spots were punched out and glued on. My son added googly eyes to his turtle. The lizard uses both the layered technique and the added spots from the hole punch. The frog has a wire with a fly attached. I though it would be neat to be able hang these up. The frog looked like he was jumping so I gave him something to jump for. This was a satisfying art activity. Though we took our examples from the book for this particular project there are so many opportunities for kids to use their imaginations and get really creative here. Collage is very enjoyable and we will certainly be getting out the papers and punches again soon to make more Lots of Spots creations. If you enjoyed this post please sign up for our newsletter. It is totally free and I share wonderful things for boys, including some I don’t share here on the site. 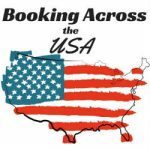 As I said earlier, this post was part of a series called Booking Across the USA. Please visit Growing Book by Book to see the activities for all of the states. I promise you it will be a great, literary trip across the USA! Our big list of great books for boys. 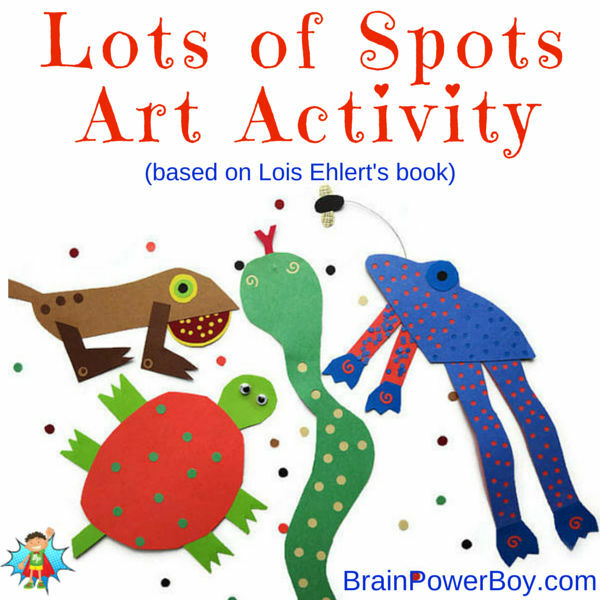 I really like these books but I really love your Lots of Spots Art Activity. I will be using that at work. Thanks for the activity idea! Thank you so much Shelah. It was a very fun art activity to do. Glad you can use it at work. What a fun activity! I love Lois Ehlert books. I know my son will love this craft. Thank you for the idea! Thanks Marie, I hope he enjoys it. I have not seen her books before. I will take a look soon! They look great! You are in for a treat! Her illustrations are quite delightful and we enjoy her books very much. What fun activities to compliment Ehlert’s work. Thank you so much for being part of the Booking Across the USA project! It was my pleasure Jodie. Thank you for all your work on Booking Across the USA. It was wonderful to see everyone’s posts. Ou state of WI ROCKS! There is so much for our kids to learn right in our backyards! Thanks for your time on this! LOL oh, yes Wisconsin is great 🙂 You are most welcome, Tracy. Thanks for stopping by. Always lovely to meet another book lover! I am happy to hear your kids would enjoy the craft–it was a lot of fun. Hooray for fellow Wisconsinites! Great author choice, and your art project turned out super cute. Really fun. Thanks for sharing with #KidLitBlogHop! Hey 🙂 So nice to see someone from Wisconsin here! Thanks for the nice comment. 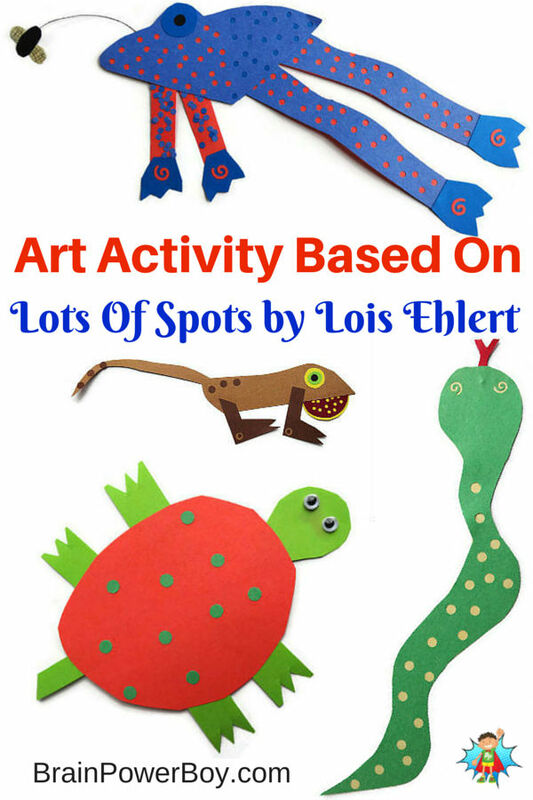 I adore Lois Ehlert, and this is a great activity! Thanks for stopping by MaryAnne 🙂 I too am a huge fan of Lois Ehlert. So glad you like the activity! I did read through Waiting for Wings and you are right it is a wonderful book. Thanks for stopping by. I have chosen your post as one of my favorites to feature in this week’s #WeLoveWeekends! I hope you’ll be back to share with us again! Thanks for the comments Meghan and for the feature! I will come and check out your gardening post. We haven’t read any Lois books yet but we really should as they are so bright and colourful! I love the activities – pinning this one to inspire me later!